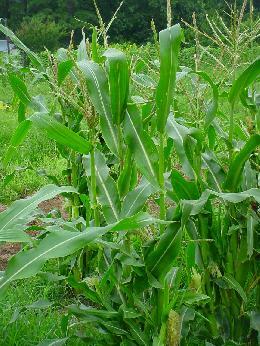 Botanical Significance: Corn or maize is derived from teosinte (Zea mays subsp. mexicana) and tripsacum; wild grasses that still grow in the region. 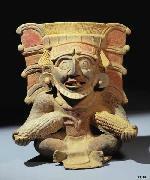 Ritual Significance: Due to the importance of maize to the ancient Maya it is represented on many ceramics. Only a few examples have been included here. Due to the importance of this crop and the development of farming techniques such as terrace farming, it is no wonder that its representation is wide spread. Other plants in the Poaceae/Gramineae family such as Cymbopogon densiflorus have been used for its hallucinogenic properties. In smoking the flowers, it is believed that dreams in this altered state can foretell the future. Leaves and rhizomes from other plants in this family are also used for similar uses. Hanab Pakal was depicted as the Maize God. He can be seen wearing a net skirt with the Cosmic Turtle on his chest. Named Hun-Nal-Ye (“One Grain of Maize”), Hun-Nal (“One Ear of Maize”), and Wak-Kan-Ahaw (“Raised-up Sky Lord”). Father of creation (as described under The Gourd Tree). Maize God sons - the Hero Twins, Xbalanque and Hunahpu, bring the Maize God back from the dead in agricultural renewal (cycles). Maize God (God E) can be recognized by a corn curl on or around face. It is believed that a jade bead in the mouth of the deceased equals an endless supply of maize. It is also believed that the Maize God decapitation is analogous to harvesting ears of maize.